IDC has finalized its report during the first quarter of the year in global Smartphone market and the in the general market as well. According to the numbers Smart phones continue to gain speed and have finally outselled featured phones. According to a survey total number of phones shipped was 418.6 million units out of which percentage of Smart phones were 51.6 %, their number was 216.2. In comparison to last year’s Q1 , 402.4 million units shipped. Samsung again dominated by manufacturing 115 million units out of which 70.7 million were Smart phones. Its share in Global Smartphone Shipments is 32.7 and 27.5 % of all the phones shipped in the last quarter, this was enough for Samsung to be in the first position in both categories. 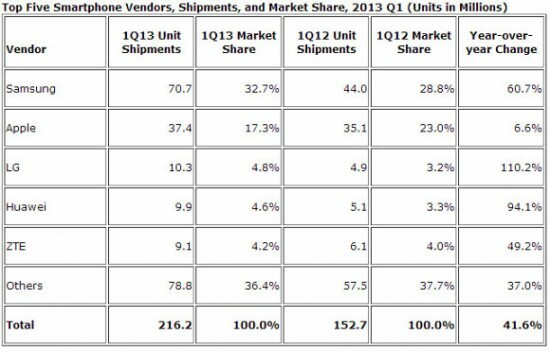 Its Smartphone shipment percentage is increasing year over year. 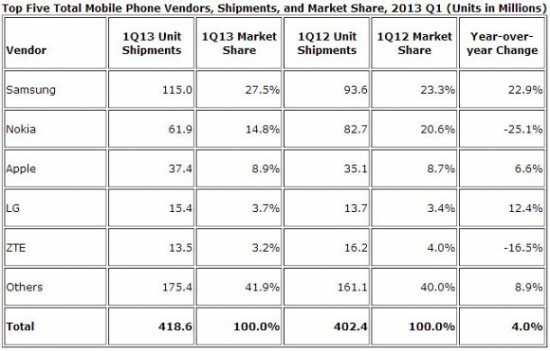 LG settled to third place in the Smartphone Market shipping 10.3 million Optimus devices. Achievement of biggest year over year growth is also credited to the LG, as they just sold 4.9 million units in just the first quarter of 2012. After LG, Hawaii is ranked, selling 10 million Smartphones in the past three months. During the last year’s quarter 1, 152.7 million Smartphone’s were shipped while this year 216.2 million Smartphones were shipped , constituting a growth of 41.6% growth. The growth of total phones shipped were just 4.05%, suggesting that the feature phone sales have declined significantly.